Does your pet fish have trouble swimming? If your fish floats on the surface or has a difficult time rising from the bottom, he has a buoyancy problem. The Japanese named this syndrome "tenpuku” disease, which means "capsized." Does your pet fish have trouble swimming? If your fish floats on the surface or has a difficult time rising from the bottom, he has a buoyancy problem. Buoyancy trouble is a common and widespread problem. A recent study published by the Japan Aquaculture Society Journal described the condition in detail and named this syndrome "tenpuku” disease, which means "capsized." Buoyancy problems are caused by a wide variety of disorders. Some of these include systemic disease (bacterial, viral, fungal, parasitic, cancer), starvation, general weakness, eroded fins and broken fins, swim bladder diseases, and excessive air in the gastrointestinal tract or abdominal cavity. Buoyancy disorders of goldfish, especially the round-bodied ornamental varieties like orandas, lionheads, bubble-eyes, Ryukins, and moore, is one of the most common and frustrating problems confronting the pet fish hobbyist and aquatic animal veterinarian. Many buoyancy problems are simply idiopathic, which means that there is no known cause, and are associated with the swim bladder – a small epithelium-lined sac in the anterior abdomen responsible for maintaining buoyancy. The sac inflates if the fish needs to be more buoyant and deflates if the fish needs to be less buoyant. Goldfish and some other fish are members of the cyprinid (minnows and carp) family and are physostomous, which means there is an open connection between the esophagus and the swim bladder. The bladder is called a pneumocystic duct, and it allows additional adjustment of buoyancy by letting air out through the digestive tract. Sometimes the swim bladder is affected by food impactions. Viruses and bacteria can inflame the lining making it difficult for gases to diffuse across. And the genetically selected rotund body type of the goldfish predisposes them to food impactions, which in turn clog the pneumocystic duct. Then, too, feeding dry foods which tend to take on water like a sponge and expand in the fish helps to cause food impactions. The condition may be temporary or permanent, and most fish remain alert and continue to eat. Meanwhile, the other fish in the aquarium or pond are usually unaffected. Your veterinarian can help you diagnose this problem by performing a physical examination of your pet and perhaps taking a radiograph (X-ray) of your fish. Usually there is a recent history of the goldfish appearing upside down at the surface of the water. While a number of medical and surgical procedures have been tried to correct the problem, results are usually not successful. Oddly enough, one treatment that has had good results is feeding your fish a pea. That’s right, a single green pea (canned or cooked and lightly crushed) once daily often helps cure the problem. Exactly how the “green pea” treatment works is unknown, but it is possible that the pea helps move or displace lighter and/or air-filled food through the digestive tract. Your veterinarian should still examine your fish, including a physical examination and radiography; however, the harmless and inexpensive "pea treatment" seems to have its place in managing buoyancy problems of goldfish. The “green pea” protocol should also include increasing the water temperature to 75 to 80 degrees Fahrenheit and continued feeding of the regular commercial fish food. However, discontinue feeding your fish floating pellets or flake food. 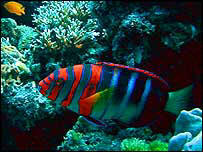 Select fish that are swimming and behaving normally in the pet store aquarium. Quarantine any new fish for one month before introducing them to your established aquarium or pond. If you are keeping round-bodied varieties of ornamental goldfish, then it is probably a good idea to feed them sinking pellets and supplement their diet with some green vegetables, including canned or frozen peas.